January 2016, which began as the worst start to a year ever for US equities, saw a rebound in the last two weeks of the month to become just the worst January for equities since 2009. Of course, the loss of momentum in US stocks had been developing since the S&P500 hit an all-time high in May 2015. Over the past year, I posted twice on the theme of momentum. In March, in a post titled Chronic Dissonance: Boom or Bust, I compared two global macro investment frameworks that were sending quite different signals. The first was the High Frequency Momentum Investing (HFMI) approach, which closely follows developments in macroeconomic data to track the business cycle, inflation trends and central bank policy guidance to assess the likely direction of interest rates, exchange rates, equity prices, commodity prices and credit spreads. The second was the Balance Sheet Capital Preservation (BSCP) approach, which follows less-watched data on capital flows, national and sectoral balance sheets, debt levels, credit spreads and market liquidity, and interprets high-frequency economic data against the backdrop of balance sheets and valuation levels. I remarked at that time that the investment views of some of my favourite practitioners of these two frameworks were diverging and offering very different investment advice. The HFMI approach was bullish on global growth prospects and its strategists were recommending going all in on the "growth trade", characterized by overweight positions in equities, select commodities and credit and underweight positions in government bonds, especially long duration bonds. The BSCP approach was much more bearish, emphasizing the continued rise in global debt ratios, the overbuilt or bubble conditions that exist in some key economies and sectors, and the persistence of deflationary pressures. Given my views that valuations across many asset classes were stretched, I sided with the BSCP approach, favouring a more defensive portfolio, holding 45% equities, 25% bonds and 30% cash with a high exposure to US dollar denominated assets. In April, I returned to the momentum theme with a post titled The Big No and the Big Mo, in which I argued that the US Fed's decision to move toward what I called "The Big No", monetary policy normalization, would bring to an end "The Big Mo", the momentum trade that had seen the steady rise in the valuations of risk assets that had accompanied the use of unconventional monetary policies. Looking back, I think that both of these posts stood up pretty well as the year unfolded. After rallying early in the year, US high-yield credit peaked at the end of February. US equities peaked in mid-May. From mid-May until the end of January, the US equity ETF (SPY) returned -9.1% in USD terms, the Canadian equity ETF (EWC) returned -26.2%, the US high yield credit ETF (HYG) returned -9.4%, and the US 10-20yr Treasury bond ETF (TLH) returned +5.0%. It seems that the concerns of strategists following the BSCP approach were borne out. A momentum shift occurred. As these events were unfolding, I was reading Gary Antonacci's new book, Dual Momentum Investing. It is easily the best investment book I read last year, and one of the best I have ever read. I am not going to review the book, but I will say that even if Antonacci's strategy doesn't suit your investment style, you will learn a great deal about asset return momentum, portfolio theory and asset allocation from his book. Momentum, or persistence in performance, has been one of the most heavily researched finance topics over the past 20 years. Academic research has shown momentum to be a valid strategy from the early 1800s up to the present, and nearly across all asset classes. After many years of such intense scrutiny, the academic community now accepts momentum as the "premier anomaly" for achieving consistently high risk-adjusted returns. In my opinion, the best part of the book is Chapter 8, where Antonacci provides a simple, practical method of constructing an investment approach based on Dual Momentum, which can be implemented using the same kind of low-cost global ETFs that I use for the portfolios that are tracked in this blog. Antonacci distinguishes between "absolute momentum" and "relative momentum". Absolute momentum is an absolute return concept, an asset's excess return (i.e., its return less the riskless t-bill return) over a given look back period. If an asset's return has been going up more than the T-bill return, it has positive momentum; if less, it has negative momentum. Relative momentum is a relative return concept, which compares an asset's excess returns to those of its peers over a given look back period. For example, one could compare the returns of the S&P500 with returns on other equity indexes, such as the Euro Stoxx, or the Japanese Topix, or the Canadian S&PTSX300, or the FTSE Emerging Markets index to judge relative equity momentum. The relative momentum rule requires a comparison of the past 12 month returns for U.S. versus international stocks. The absolute momentum rule compares the higher trending of these two stock markets to the past 12 month returns for t-bills. 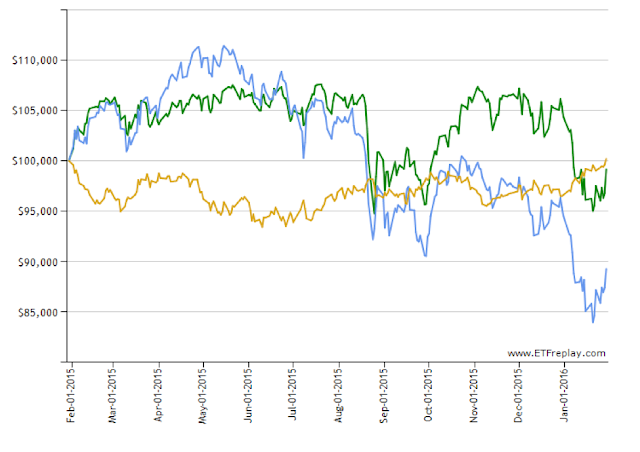 If the S&P 500 [or SPY] has a higher return than both international stocks [ACWX] and cash [i.e. t-bills], you hold the S&P. If international stocks have a higher return than the S&P and cash, you hold international stocks. If cash has a higher return than stocks, you hold the bond fund [TLH]. The chart below shows total returns, as growth of $100,000 in USD terms, for SPY (green line), ACWX (blue line) and TLH (yellow line) from March 31, 2008 through Jan 29, 2016. Antonacci backtested the Dual Momentum approach and found that over the 40-year period from 1974 to 2013, the approach "has an average annual return of 17.43% with a 12.64% standard deviation, a 0.87 Sharpe ratio, and a maximum drawdown of 22.7%. This almost doubling of the [MSCI All-Country World Index] comes with a reduction of volatility of 2%". So What's Happened to Momentum Lately? The chart below shows the 12-month total returns for SPY (green), ACWX (blue), and TLH (yellow) through the end of January 2016. [Total returns include all dividend and/or interest payments]. The month-end 12-month return on SPY has fallen below zero, as has the return on ACWX. By my reckoning, this implies that the Dual Momentum approach would shift out of SPY into TLH, the bond ETF, at the opening of markets on February 1, 2016. One concern some investors may have about the Dual Momentum approach described above might be that that it is a concentrated portfolio holding only one ETF at a time. Another concern may be that using a 12-month return, the approach might not perform well in the event of a sudden meltdown in financial markets. Nevertheless, Antonacci's Dual Momentum Approach has an enviable back-tested track record and opens up a wealth of possible ideas for structuring global ETF portfolios. Momentum has shifted. After several years of stronger 12-month total return momentum for global equities relative to other asset classes (including bonds, credit, inflation-linked bonds (ILBs) and commodities), in December global bonds return momentum overtook that of global equities in CAD terms, and in January 2016 global equities sank to the lowest momentum asset class. Even the best commodity ETF that I track, GLD, the gold ETF had stronger 12-month momentum than SPY, the best equity ETF. The chart below splices together the 12-month returns on the top performing equity ETFs, top-performing bond ETFs (including credit), top performing ILB ETFs, and top performing commodity ETFs that we track. In the case of global equities, for example, over the 36 months ending December 2015, momentum leadership was held by the US large-cap equity ETF (SPY) for 11 months, the US small-cap ETF (IWM) for 9 months, the Japanese equity ETF (EWJ) for 8 months, the Eurozone equity ETF (FEZ) for 6 months, and the Canadian equity ETF (XIU) for 1 month. Since this blog is focussed on Canadian investors in global ETFs, the returns in the chart are shown in Canadian dollar terms. The chart shows that, in CAD terms, 12-month momentum in global equities has exceeded that of the other asset classes in 33 out of the past 37 months. The exceptions were January 2015, October 2015, December 2015 and January 2016. On each of these occasions, the best global bond ETF return exceeded the best global equity ETF return. And on each of these occasions, the best global bond ETF was the 10-20yr US Treasury bond ETF (TLH). I have examined an investment approach using this data and a rule that says hold only the ETF with the best 12-month return momentum (Mom12) determined at the end of each month. Also, to alleviate concerns about sudden corrections and concentration in a single ETF, I have also looked at employing 6-month momentum (Mom06) and choosing the two top performing ETFs across all of the asset classes. The chart below shows returns that would have been generated by these two approaches, as well as returns from the more diversified portfolios that we normally track, from the beginning of 2013. Over the past three years, the two portfolios based on simple momentum rules would have outperformed all of the other more diversified portfolios that I normally track. 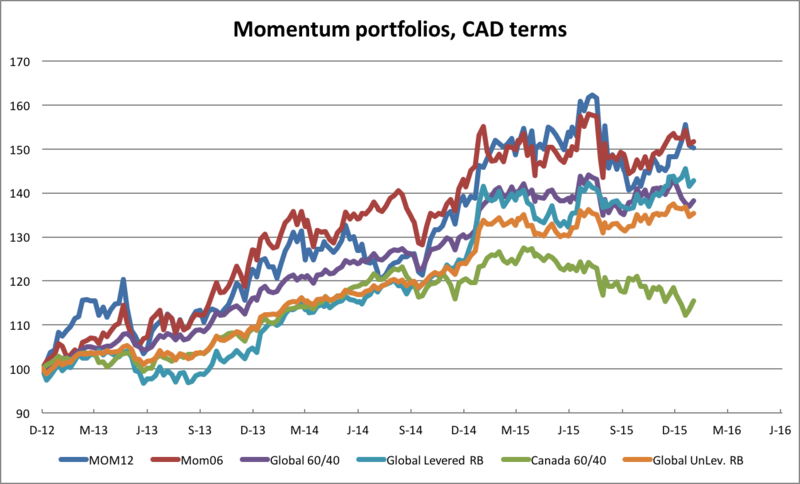 Over the entire period, both the 12-month momentum portfolio (Mom12) and the 6-month momentum portfolio (Mom06) have generated returns of over 13.5% annualized in CAD terms, about 2% per annum above the best of the diversified portfolios and about 9% per annum better than a simple all-Canadian 60/40 ETF portfolio. As might be expected, the momentum portfolios have had higher volatility than the other more diversified portfolios, but the higher volatility has generated higher returns over the recent period. It is also worth noting that, at the end of December, the Mom12 portfolio fortuitously shifted out of equities (specifically EWJ, the Japanese equity ETF) into bonds (specifically TLH, the US 10-20yr Treasury Bond ETF) and thereby managed a monthly gain for January of 1.3% in CAD terms. The Mom06 portfolio wasn't so lucky; based on 6-month momentum it held 60% SPY and 40% TLH in January, which resulted in a -0.5% monthly loss. Nevertheless, both portfolios outperformed the Global 60/40 and the Canada 60/40 portfolios, which returned January losses of -2.6% and -1.2% respectively. I believe that there is strong academic support for employing momentum in asset allocation in order to achieve higher risk adjusted returns. Gary Antonacci has provided an easy-to-execute momentum approach which has outstanding backtest results. 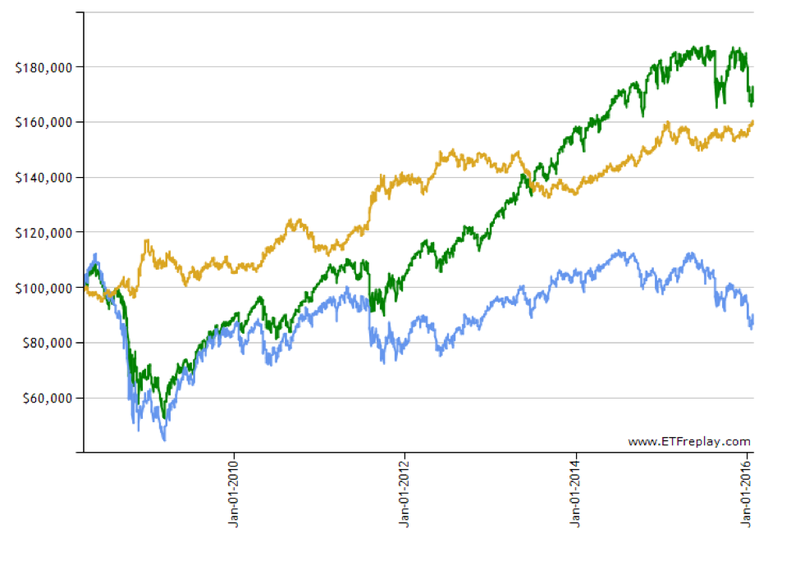 I have identified two rather simple approaches using the global ETFs that I track. My results over the past three years discussed above, while not a robust backtest, are encouraging. In particular, I like the ability of the suggested momentum portfolios to take currency movements into account. During the recent period of Canadian dollar weakness, these momentum approaches would have had Canadian investors out of Canadian dollar denominated ETFs for virtually the entire period. 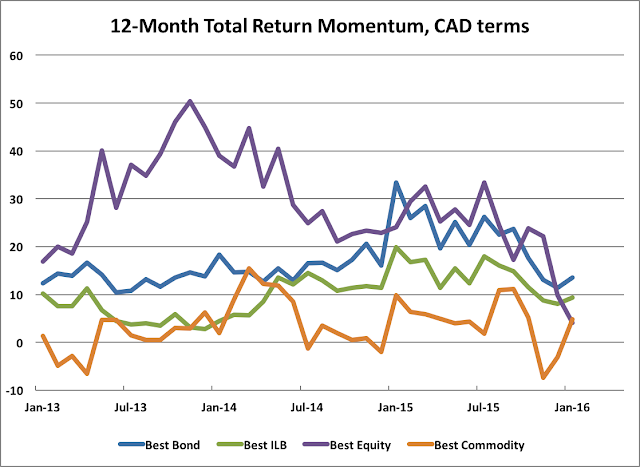 When the Canadian dollar rallies back, it will be reflected in the relative total return momentum (in CAD terms) of the ETFs. This does not mean that I will make a wholesale shift away from assessing global macro factors in my asset allocation decisions. Both the High Frequency Momentum Investing and the Balance Sheet Capital Preservation approaches that I have written about remain useful and insightful approaches to asset allocation. But I'm convinced that adding the momentum factor can improve investment results. While investors are surely hoping that the worst is over for 2016, the momentum approach is still suggesting caution. Momentum rules point to overweighting (if not fully allocating) portfolios to bonds.